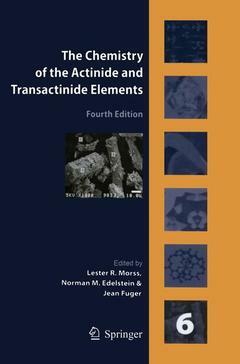 Coordonnateurs : Edelstein Norman M., Fuger Jean, Morss Lester R.
This volume is a continuation of the five volumes of The Chemistry of the Actinide and Transactinide Elements that appeared in 2006. Volume 6 expounds on topics in actinide science that are undergoing rapid scientific developments and that are germane to the safe development of nuclear energy in the 21st century, from nuclear fuels to the environmental science and management of waste. The scope of volume 6 encompasses a wide array of subjects: actinides in the geosphere, subsurface interactions of actinides species with microorganisms, chemistry of nuclear fuels, actinide waste forms and radiation effects, analytical chemistry of plutonium, actinide chalcogenide compounds, molecular spectroscopy and reaction of the actinide ions in the gas phase and rare gas matrices, and hydrothermal synthesis of actinide compounds. The authors of each chapter are active practitioners and recognized experts in their specialty areas. They have collaborated so as to provide an authoritative, balanced, and comprehensive treatment of their fields. Each of the topics in volume 6 represents the current state of our knowledge in this fascinating area of science and technology. Actinide behavior in the geosphere.- Subsurface Interactions of Actinide Species with Microorganisms.- Chemistry of Nuclear Fuels.- Actinide Waste Forms and Radiation Damage.- Analytical Chemistry of Plutonium.- Syntheses and Properties of Actinide Chalcogenides.- High Resolution Spectroscopy and Gas Phase Reactions of Actinide Molecules.- Hydrothermal Syntheses of Actinide Compounds. Expounds on topics in Actinide Science that are critical to safe Nuclear Energy development. A valuable addition to the previously published 5-volume set of "The Chemistry of the Actinide and Transactinide Elements"